Understand the logic behind competition. Study the impact of the number of competitors on competitive intensity. Players are competing vs other players and must select their price on 2 markets with differentiated demand: On each market, the marginal cost of production is constant and equal to 4€ and players can sell up to 1000 goods on each market. What differs is the number of competitors. 2 different markets with 14 players in each, for the first experiment. 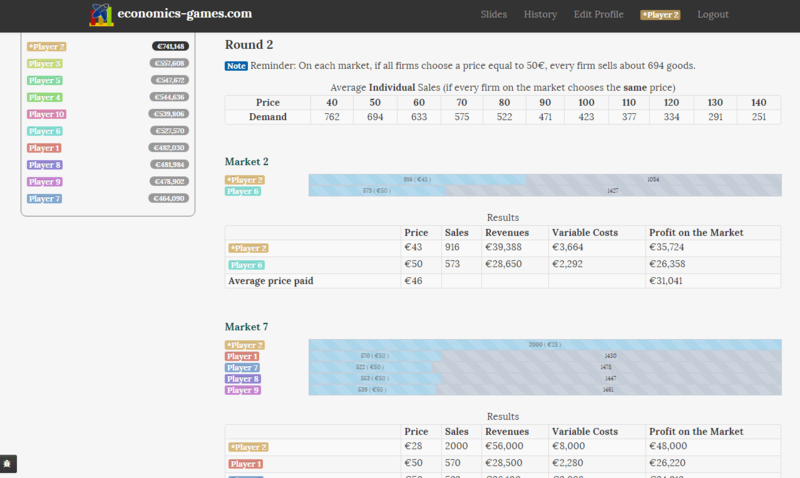 6 different markets with 4 or 5 players in each, for the second experiment. To be able to compare, on each market, demand is proportional to the number of firms. The game is repeated. If the number of competitors is different enough from the first experiment to the second (or equivalently, if the number of universes is different enough), even though the number of potential customers per firm is the same on each market, competition will be much stronger on markets with more competitors: Prices and profits will be lower on these markets. I would recommend to have markets with 2 players for the first experiment (i.e. choosing n/2 universes when creating the game), and 2 big markets with half of the players on each for the second (choose 2 universes). Alternatively, if you have not run the monopoly game before, you can have monopolies in the first experiment if you want (take the number of universes to be equal to the number of players). Just avoid having only 1 universe in an experiment to avoid over-aggressive strategies from some players, who would probably try to harm their competitors rather than maximize their profit. This allows to debrief by comparing with the monopoly outcome, reminding students of the trade-off between margins and sales (and the notion of Price-elasticity of demand) and talking about the impact of the number of firms on the incentive of one firm to undercut its rivals' price (higher relative gain of lowering your price when your current market share is smaller). This is a good opportunity to talk about residual demand and marginal revenue and maybe relate this analysis to the monopoly case. I like to present the following situation to my students after the game: Starting from a situation in which 10 different firms are monopolies on separate markets with identical demands, imagine that for any reason (disappearing trade barriers for example), all 10 "small" markets are gathered into a "big" market with ten times as many potential consumers and all 10 firms: How will prices, sales and profits evolve? (I can then underline that "extra incentives" for one firm to lower its price appear in the big market, as it is rewarded by extra sales coming from customers that were previously in separate markets. And that this effect is all the more important as more "small" markets are gathered together). This may also be a good opportunity to talk about the prisoner's dilemma and/or collusion in repeated games (impact of the number of firms on collusion). If every player charges a price equal to 50€, each player will sell about 694 goods. If every player charges a price equal to 40€, each player will sell about 762 goods. And this is true on every market (which means, of course, that the market with more firms has more potential customers than the other). You can sell up to 2000 goods on each market. Your goal is to maximize your company's profit, not to beat your direct competitors nor to sell the maximum number of goods (your final ranking will be determined by comparing your profit with those of every other players, some of which may compete in different "universes"). Your score is determined by multiplying your profit on each market by the number of firms on the market: Thus, profits on a competitive market with 8 firms count twice as much as profits on a market with 4 firms.